As someone with a great experience and knowledge about the topic, Do you believe GMO are a better nutritious option than nonGMO crops? In addition to the response by Ruth MacDonald, Professor and Chair, Food Science and Human Nutrition, Assistant Dean of Graduate Programs, College of Agriculture and Life Sciences, Iowa State University, in the spring of 2016, The National Academies of Science, Engineering and Medicine (NAS) issued a report confirming the safety of GMOs and also their compositional and nutritional equivalency with non-GMO foods. The NAS confirms, “Statistically significant differences in nutrient and chemical composition have been found between GE (genetically engineered) and non-GE plants by using traditional methods of compositional analysis, but the difference have been considered to fall within the range of naturally occurring variation found in currently available non-GE crops.” Click here to read the full report. In addition, here is an example of a compositional study on GM papaya vs non-GM papaya. The study shows that the levels of vitamins and other nutrients in GM and non-GM papayas are the same. 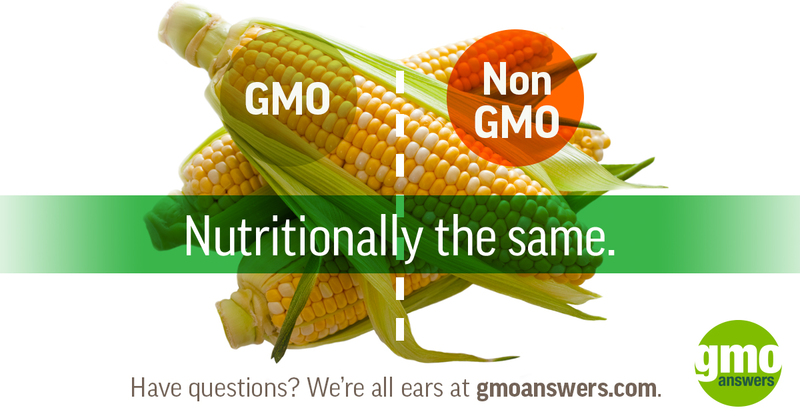 While most GMO crops are nutritionally equivalent to their non-GMO counterpart, enhancing a crop’s nutritional value is one of the many uses of genetic engineering. Genetically modified high oleic soybeans with an enhanced oil profile, much like olive oil, have been developed and are longer lasting and trans-fat free. Another example is the Innate potato that has lower levels of asparagine, which when heated, turns into acrylamide, a potential carcinogen. If a GMO crop’s nutritional content has been intentionally modified, that specific characteristic will be noted on the food package label.